Being on the road in a car while lightning is flashing all around me is something I don’t think much about when it’s happening, given that I was born and raised in Florida, a state historically known as the Lightning Capital of the World. But, I have always wondered what would happen if lightning were to hit my car while I was driving. How do I stay safe in that situation? Thankfully, those are things I do already anyway. I close my windows during a storm like a second-nature reflex, and I don’t usually rest any part of my body on any metal, glass, or other parts of my car that may conduct an electrical current during a potential lightning strike. What Happens To Lightning After It Strikes Your Car? This is what I wanted to know… After all, here I am sitting inside of my sedan begin struck by a rod of electricity carrying up to 1 billion volts (yeah, lightning is fairly hot). Surely my little car and I are no match against that force of Mother Nature. Or are we? As it turns out, in most cases a lightning bolt will pass right through the car’s metal framework, beyond the tires, and right into the ground. Not all vehicles are safe to be inside of during a thunderstorm. Take, for example, a convertible. The only shield of protection you really have around you when riding in a typical, hardtop car is the metal body, which takes the brunt of the lightning bolt’s fury and guides the charge right toward the ground. So, when you’re in a convertible, there is no shield of protective metal enveloping you, and the only thing between you and 1 billion volts of lightning is 1/8″ of cloth. You also aren’t safe in a golf cart since it, too, lacks a shield of metal and glass. The same applies to motorcycles, bicycles, and most boats – you simply aren’t safe in or on any of those vehicles when lightning strikes because there is nothing to direct the lightning away from you and toward the ground. Interestingly, most planes are safe to be in during a lightning storm as, like conventional cars, their exterior metal and glass shields the occupants within from the lightning. 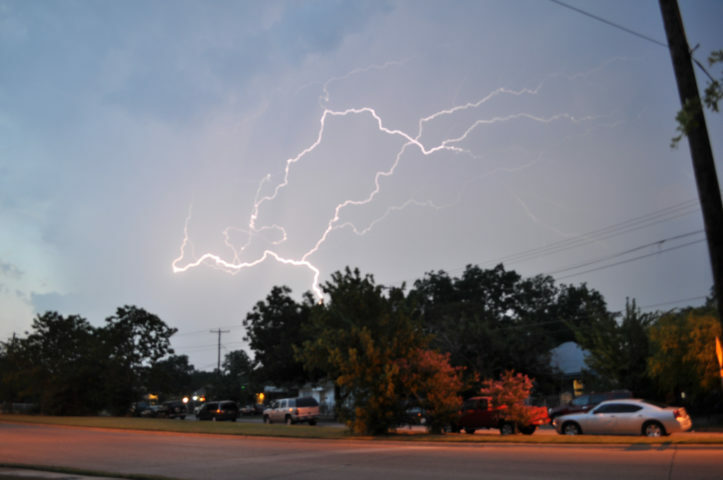 Whether you’re inside a vehicle completely enclosed by metal and glass or your outdoors on the beach enjoying a picnic, it’s useful to know how to tell when lightning may soon be heading your way. If one or more of these things start happening while you’re outdoors, quickly seek shelter inside a safe automobile or enclosed shelter (bus stop coverings, sheds, and picnic shelters are not safe). Wait until at least 30 minutes after the last thunder clap to emerge from your shelter and return to outdoor activity.